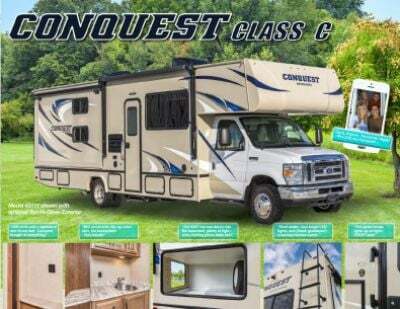 Embark on an ambitious adventure with the 2020 Gulf Stream Conquest 6256 Gas Class C Motorhome! Here at Gillettes Interstate RV, we're not only mid-Michigan's largest, full-line RV dealership, but we've been in business for more than four decades! With our low, low prices and easy financing, we can put you in the RV of your dreams quickly and easily! We're conveniently located at 7210 E Saginaw St East Lansing Michigan 48823, so stop in and see us today! You'll drive away with the RV you've always wanted! Even if you don't live in East Lansing, we can still help you. Visit us online and give us a call at 517-339-8271. With our door-to-door, 24/7 delivery service anywhere in North America, we'll help you find the perfect RV at the perfect price! There's plenty of room inside this 25' 1" long, 8' 4" wide RV, but if you need more, then you can just slide out the slides! 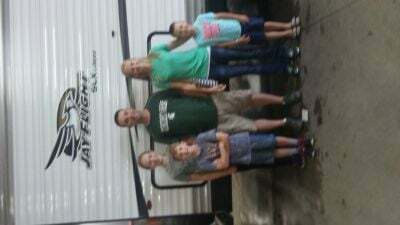 You won't be crouching as you walk around inside this 11' 3" tall RV! Thanks to the reliable 25000 BTU furnace and the 13500 BTU a/c unit, you can enjoy comfortable living no matter how the weather is outside! Trade in the s'mores and trail mix for a real, hot meal! Cook up tasty meals for the family in the kitchen! It comes with a wealth of modern appliances, including the 3 burner range cooktop, the 6.00 cu. ft. refrigerator, and more! With the 37 gallon fresh water tank, your family can enjoy an abundance of clean water throughout the entire trip! The 42 lbs. of LP tank capacity allow you to enjoy long, hot showers in the bathroom. The shower's used water is dumped into the 24 gallon gray water tank. The bathroom also has a Plastic Foot Flush toilet, with waste stored discreetly in the 24 gallon black water tank. One of the handiest nighttime accommodations is the roomy bunkhouse with its Bunkbeds! It's comfy and private, and kids will love it!